Usui Shiki Ryoho & Karuna Reiki. A Safe Natural Therapy for all conditions. Reiki (pronounced Ray-Key) means 'Universal Energy' and is an ancient healing therapy which is believed to have originated in Tibet and was developed in Japan in the early 20th century, then introduced to the Western World in the mid 1970's. Eastern medicine has always worked with energy which flows through all living things known as 'ki' in Japan, 'chi' in China and 'prana' in India. Accupuncture and Yoga work with and assist in the free flow of this energy in a person. Since the mid 1970's its use has spread worldwide and now millions of people use Reiki to help themselves and others encourage the natural healing processes of the body. It is neither cult, religion nor a belief system. It is a healing energy activated by intention. Reiki works on every level, not just the physical and promotes the body's regenerative self healing ability. Reiki has a similar effect on the mind and body as meditation. It encourages personal and spiritual growth, stimulates and expands consciousness and awareness. One hour of Reiki is the equivalent of three to four hours deep relaxing sleep and as sleep is the body's natural healing process we can see why Reiki is one of the most effective, safe, natural stress relief and health improvement therapies today. Reiki is a gentle yet powerful complementary therapy that can be used alongside orthodox healthcare and other natural therapies with complete safety and confidence. Reiki can be used by all people, the elderly, pregnant mothers, babies, children and can be used in any situation. Reiki works by activating the body's own healing ability. It works on all levels, physical, mental, emotional and spiritual gently encouraging old patterns to release and clear negativity, which in turn gives us a closer connection with our own inner wisdom. Also it can help to reduce pain, inflammation and help to heal tissues and rebalance organs. Reiki encourages positive changes such as taking more exercise, reducing the need for alcohol and tobacco, taking time for yourself to relax, improving your diet, which in turn brings about a greater feeling of peace and harmony. 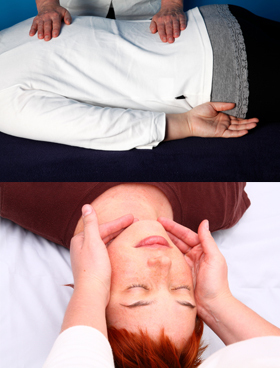 You may receive a Reiki treatment lying down or sitting in a comfortable position. Reiki passes through ALL materials so there is no need to remove any clothing for the treatment. A practitioner gently places their hands on the body in various different hand positions. The recipient automatically draws in as much or as little energy as is needed and uses it as necessary at that specific time. Reiki can be felt in various ways, often it is experienced as a heat between warmth and boiling heat (not unpleasant). Or it can be felt as cold, tingling or twinges this can be where an energy build up is ready for release. Also many people experience a deep dreamy effective where the body is in deep relaxation, sometimes you may experience different colours, receive insight in to a problem, have visions or have a past life experience. Also there may be an emotional release as energy build ups are released. Depending on your needs a treatment plan will be discussed with you, just one treatment will make a difference, however a course of regular treatments will be more effective. This will vary depending on your own individual needs and will be reviewed subject to your own preferences and progress.